Is it just me, or is the schedule for back-to-school sales starting to get just as out of control as Christmas sales? It seems like Christmas starts right after Halloween and the back-to-school sales start as soon as the swimming pools open up for the summer. This rush puts a crimp in my summer joy. I thought about resisting. I thought about just buying my supplies when I’m down to the last paper clip or holding pencils the size of those mini-golf mini pencils. Then I got my hands on the Staples ad this week and had to admit that there were some good deals, so I swooped by to stock up my own office for the year and to grab some writing center supplies. I was a goner. Despite my efforts to resist, I gave into my irrational belief in notebook magic. The belief works like this. I see a beautiful, whimsical, trendy, unusual, or otherwise above average notebook, and I see myself in a boring meeting. But, the kicker is, I don’t know that the meeting is boring and pointless because I’m writing in cursive that would make Thomas Jefferson jealous, capturing to-do items with gleeful abandon and gliding out the door ready to take initiative on tasks meticulously noted in my stellar notebook. Of course, the notebook magic is all smoke and mirrors. I still rush into meetings 3 minutes late, bump the chairs of several colleagues, and wind up thinking, “Huh…I don’t know if I need to know this.” Then, I do find out what I need to do — sorta– and jot down my best guesses in an awkward hybrid between print and cursive, getting the notes on the actual lines if I’m lucky that day. I bustle back into my office, get distracted by the 20 emails that have accumulated in my absence, and promptly lose my superior notebook under a pile of not-so-superior paper on my desk, which is where is will stay until my next meeting. At that point, I’ll spend so much time looking for my notebook that I’ll again show up 3 minutes late and spend the first 20 minutes of the meeting realizing that I’m late on every to-do list in my possession. But, with back-to-school sales, anything is possible, right? Anyone can turn a new page. 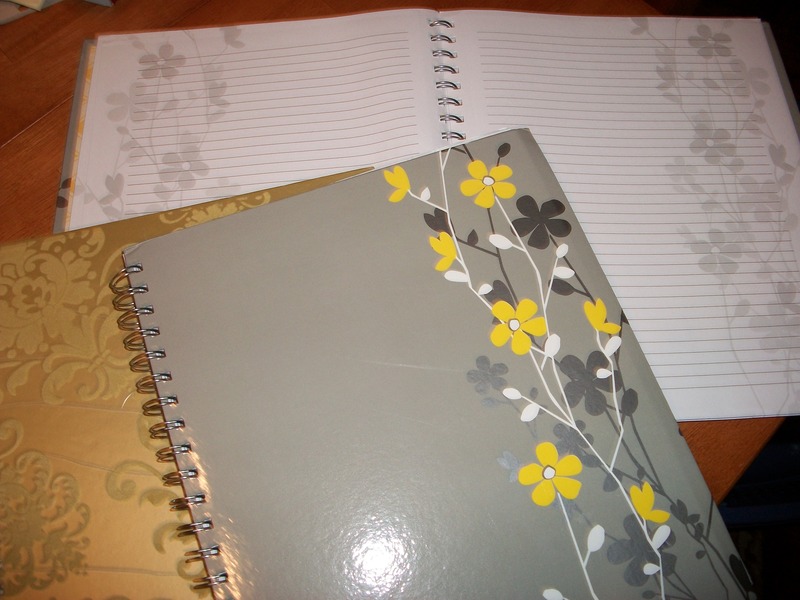 After all, take a look at those notebook pages; they even have flowers on them. I’m going to do it. I’m going to work the notebook magic. Does anyone have a sample of Thomas Jefferson’s handwriting that I can borrow? Here’s to Tuesdays and new hope.